Is Star Trek’s Society Really Socialist? Some claim Star Trek presents a socialist utopia, but the themes of technology, individual rights, post-scarcity, and currency, might show otherwise. Most people who find socialism appealing often have their own distorted definition tailored to their personal desires. In addition to considering the hundreds of writers and producers all leaving their individual and sometimes conflicting impact on Star Trek, we must also consider that the franchise’s point of view is told primarily through Starfleet (military) personnel and not through the average private citizen’s perspective, so there is a distorted view of life in the future. We also must recognize that most people who find socialism appealing often have their own distorted definition tailored to their personal desires. For our objective analysis, we will go with the dictionary definition of socialism as a system that advocates for the means of production, distribution, and exchange to be owned or regulated by the community as a whole. Daily life in the 24th century is depicted as radically different than life in the 21st. There are two technological breakthroughs that are the causes of this. The most revolutionary is Warp Drive, which allows starships to travel faster than the speed of light. The device helped humans colonize uninhabited worlds to prevent overcrowding on Earth and discover new natural resources. It also led to alien contact, which helped unite the nations of Earth into one government. The expansion of territory, discovery of new natural resources, and diffusion of alien technology created a higher standard of living for humans as many resources became less scarce. Scarcity has been almost eliminated in the future. Another revolutionary development was the invention of the replicator. Replicators convert energy into matter and can later convert that matter back into energy to create something else new. By the 24th century, replicators are capable of creating almost anything (some minerals are not replicable) from food to consumer goods. You can ask the replicator for a dish of food, and it will appear out of thin air. When you’re finished eating, you put the dirty dish back into the replicator, and it’s converted back into energy. Scarcity has been almost eliminated in the future. Societies that embrace socialism have poor records when it comes to human rights. When the community has ownership of everything, the individual becomes expendable. In Star Trek, Earth and the United Federation of Planets protect the rights of people and businesses. In the TNG episode “The Drumhead,” it is revealed that the Federation’s constitution has twelve guarantees of basic rights for its citizens. The seventh guarantee is the fundamental right against self-incrimination. The twelfth guarantee covers intellectual property rights and establishes an artist as the person who created an original artistic work (ST: Voyager later has those rights expanded to holograms in the episode “Author, Author”). The emphasis on individual rights is closer to classical liberalism than socialism. We also see glimpses that private businesses exist and thrive in the Federation like Joseph Sisko’s restaurant in New Orleans, Quark’s Bar on Deep Space 9, and holodeck program publisher Ardon Broht. Private businesses and individual rights are not pillars of socialist governments. 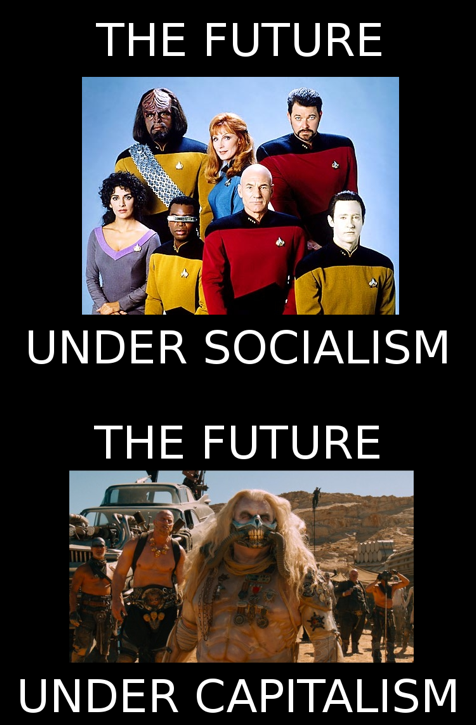 That’s because the federation and human society are not socialist. There is a higher standard of living that is the result of technological breakthroughs that eliminated hunger and poverty. Buildings can be made with replicators, and rocks can be converted into food. There are things in the Star Trek universe that are scarce because a replicator cannot reproduce them. Star Trek is what can be considered a post-scarcity society. Medical care also appears to be free (though we only see the medical world through Starfleet) thanks to advances in science. But there are things we have seen in the Star Trek universe that are still scarce because a replicator cannot reproduce them. Latinum is an alien mineral that is the galactic equivalent of gold, and it is used as currency between different societies. Space transport is also a limited resource, as there is only a certain amount of room for passengers on a ship. In Star Trek 3, McCoy tries to hire a smuggler with a ship and pay him with money. We also see that genuine antiques are an item people want and cannot replicate because it won’t be the real thing, such as in the DS9 episode “In the Cards,” when a 1951 Willie Mays mint condition baseball card is up for auction and latinum is the only payment accepted. Nog: It's my money, Jake! If you want to bid at the auction, use your own money. Jake: I'm Human, I don't have any money. Nog: It's not my fault that your species decided to abandon currency-based economics in favor of some philosophy of self-enhancement. Jake: Hey, watch it. There's nothing wrong with our philosophy. We work to better ourselves and the rest of Humanity. Jake: It means... it means we don't need money! Nog: Well, if you don't need money, then you certainly don't need mine! Some people interpret this scene as the end of the discussion that the Federation, or at least Earth, functions as a socialist society. But the issue of "no money" could boil down to semantics. The currency of Federation Credits exists, as we see in TNG episode “The Price” when the Federation negotiates exclusive use of a wormhole. Jake Sisko did not work and was a dependent of his father. His father probably had credits, but since Jake was trying to buy the baseball card as a surprise gift, he did not approach his dad. It should also be noted that the ultimate winner of the auction was a human named Elias Giger, and he paid in latinum. Star Trek presents the idea of a better future for humanity. But it’s because of technological advances rather than redistributive government policies. It’s a future where most needs and wants are no longer scarce and can be easily provided for. But, most important of all, it’s a future that protects the rights of the individual rather than bulldozing them at the whim of politicians who arbitrarily decide what’s best for the community. Individual freedom is the foundation of the Federation’s values.